Welcome to Texas Jump N Splash! Please call if you have any questions or if you don’t see what you’re looking for! 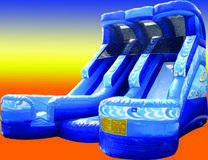 Texas Jump-n-Splash is a family-owned and operated a business in the Katy, TX area. We are a licensed, insured and inspected party rental company; providing exceptional service and quality to everyone we serve, especially kids! We proudly serve the Greater Houston community. We are SIOTO (Safe Inflatables Operators Training Organization) certified where safety is always first. We carry a unique and extraordinary selection of Bounce House products; moonwalks, combos, inflatables, water slides and much more! 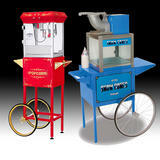 In addition, our extensive product line includes all your concession needs; popcorn, cotton candy and sno-cone machines to enhance your party experience! And do not forget to add tables and chairs to your party rental equipment needs! 1. Browse our Selection of Products. Why Texas Jump N Splash? It was the perfect way to end the school year for our kids and their friends.....love helping family-owned companies....we will see yall next year! Waterslide, Dunk Tank and Popcorn. Zorb balls, 18 ft water slide, Bungee run, rock wall, slip-n-slide, joust arena We loved working with you guys. It was so easy from beginning to end and the high school students had a blast! We will definitely use you again! Thanks for everything! Thank you Texas Jump N Splash for being a great partner at the Rosenberg Railroad Museum's RailFest 2015! Prompt, friendly and professional, we will definitely be calling again. Feel free to contact me if you find something interesting here to discuss. I’m usually available from 9am till 5pm.